Alsace was beautiful with well chosen walks. The local rep, Hannah, was very helpful, enthusiastic and attentive. This unique part of France provides a fantastic step back in time - an absolute must for the history buff and those who appreciate a good glass of wine. Having been fought over for centuries by Germany and France, this rolling, wine-growing heartland is now heavily characterised by an eclectic mix of cuisine, language, architecture and customs. Pristine German and French cemeteries offer a moving reminder of Alsace's history. Our holiday offers a leisurely walk alongside the Route des Vins, using sections of the world-famous Camino de Santiago trail, through delightful mediaeval villages and ancient neatly-groomed vineyards, passing east-facing ruined castles. For those who wish to take on more challenging terrain or longer routes, there are 2-Boot walking options attached to three of the four walking days. These take you up into the forests of the Vosges and provide a wonderful contrast to the undulating trail through the vineyards. You can visit the tiny Chapel St Alexis or The Galtz monument with its viewing platform or even have a walk around the ruins of the chateaux of Ribeauville. Each September Ribeauville town celebrates one of the oldest festivals in Alsace; the Fete des Menetriers (Festival of the Minstrels). In the C8, Ribeauville was passed to the Lord of Rappolstein (the protector of the wandering minstrels). If you look carefully, you will see evidence of the Piper. Historic Riquewihr is a highlight of the tour, an enchanting mediaeval village nestled amongst sloping hills of vines that produce the exceptional aromatic Riesling wine. We have selected traditional, family-run hotels for your stay, including the stunning Hotel des Deux Clefs in Turckheim whose building dates back to the C16 and is officially classed as a monument historique. Turckheim also has a town crier who, at 10pm, walks the streets telling of the day's events and bidding the local people a 'good night'. Hotel a l'Oriel in the heart of Riquewihr has a cosy winstub and a pretty internal courtyard. Its beautiful beamed decor is stunning and quaint. Today it's time to explore Turckheim's Renaissance church and mediaeval gate where storks still nest. Your walk through the vines takes you past flower-filled Niedermorschwihr and Ammerschwihr where you can taste the local vintage, Kaefferkopf, in cosy wine cellars. It's then on to the fortified town of Kaysersberg, voted prettiest town in France 2017, and your hotel on a quiet cobbled street in the old town. A gentle climb to the French cemetery above the village of Sigolsheim, with its panoramic views of the Alsace plains and the Kayserberg Valley. Descend through the vineyards to the Renaissance houses of Riquewihr, the 'Pearl of the Vineyards'. The town of Riquewihr is so enchanting it's been declared an historic monument in its entirety. 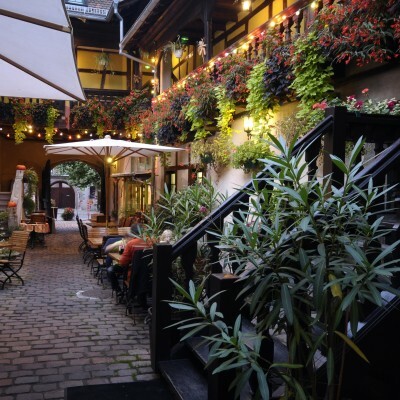 You'll be fascinated by its cobbled alleys, galleried courtyards, fountains and colourful signboards. The pretty 'Christmas Shop is worth a visit. You continue parallel to the Route des Vins to a poignant WW2 German military cemetery with panoramic views over the famous restored castle at Haut-Koenigsbourg. At St-Hippolyte there's a Gothic church and fountain, whilst the ruined court of mediaeval Kintzheim Castle is the setting for spectacular flying displays by birds of prey. At Chatenois, where the walk finishes, we give you a lift back to Turckheim. 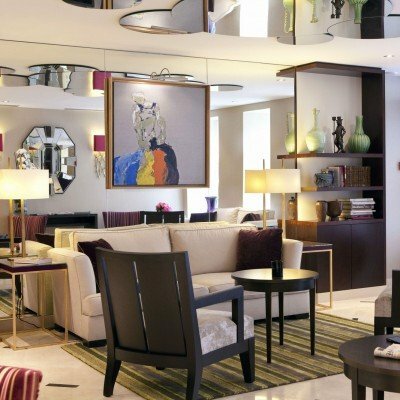 The 3* Hotel des Deux Clefs is absolutely stunning. 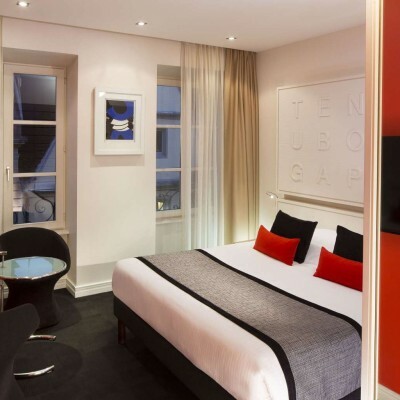 The hotel building dates back to the C16 and as such, is officially classed as a monument historique. It's easy to see why: it is an authentic Alsatian construction with timbered walls, oriel windows and lintels. Flower bedecked balconies complete its picture perfect exterior. Inside, the hotel is traditionally furnished with wooden panelled walls, and tasteful red furnishings, making it instantly feel cosy and welcoming - especially in the sitting room where you can savour a drink before dinner. The bedrooms however are fully equipped for the demands of the C21 traveller; all are en suite and feature satellite tv. Superior rooms are larger than the standard rooms and come with either bath or hydromassage shower. On the edge of the historical town of Kaysersberg, bordering forest and vineyards, the Hotel Les Remparts offers calm and comfortable accommodation. The spacious guestrooms are distributed among 2 buildings situated in the hills overlooking the beautiful, open and verdant landscape. All of the rooms are equipped with modern en-suite facilities, free Wi-Fi internet access and TV. Additional services include a bar, a sauna and a games room with table tennis, pool table and fuss-ball table. There is no restaurant at the hotel however there are plenty of dining options in the local area. Private parking is available on site. 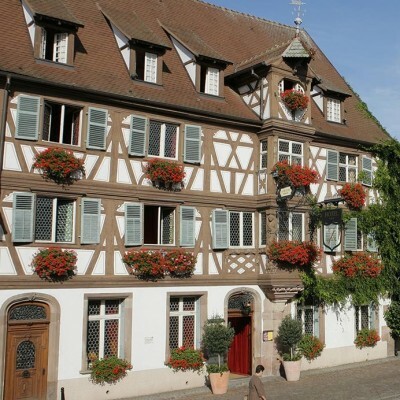 Hotel a l'Oriel is located right in the centre of historic Riquewihr. The building is centred around a central courtyard and is painted a cheerful yellow with wooden timbered balconies burgeoning with flowers. 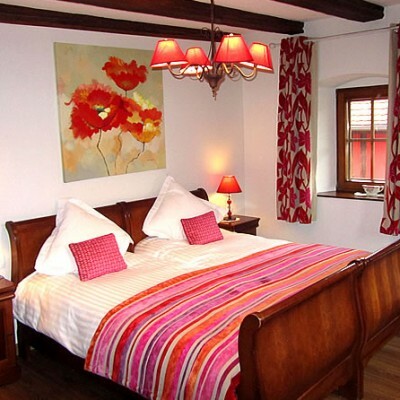 The cosy interior has been beautifully renovated to retain its traditional Alsatian style: the bedrooms, many with wooden beamed ceilings, are decorated with bright patchwork quilts and solid wooden furniture. The superior rooms are larger than the standard rooms. The suite is a larger room with seating area. The Halbeisen family and their team will welcome you to Alsace. Local wine growers since 1737, the family has converted the old wine growers farm, surrounded by their vineyards into a 3 star hotel. The hotel features a mediaeval decor with a pretty courtyard and all en suite rooms are traditionally decorated. La Cour du Bailli also offers a spa centre with an indoor pool and hot tub. The restaurant offers locally sourced produce with plenty of Alsation specialties and a full line of the best wines from the familial winery estate as the perfect accompaniment to your meals. Room upgrades: Junior Suite, Appt Privilege or Suite Privilege. This was an extremely enjoyable walk with good accommodation and fantastic views. The notes and directions were very accurate - except that the suggested timings must have been for those travelling the distances at a run and never pausing to admire the scenery, distant views and wildife and therefore should not be included to confuse "normal" folk! The Alsace offers beautifully preserved medieval villages and wonderful views and Headwater's itinerary is well chosen to offer the best of both. Our lovely, bubbly rep, Hannah, went out of her way to fill in additional information and even phoned, as a thunderstorm was breaking, to check that we were safe and well. This was our first holiday with headwater and we were impressed from start to finish. Joanne was very helpful and professional when we booked, as were the other staff in the UK in your accounts department, etc. Our rep, Hannah, was exceptional and exuded an infectious passion and enthusiasm for Alsace. She was very amiable, professional and went the extra mile to ensure our holiday was a success. She really couldn’t have been nicer and is a real asset to Headwater. We were pleased with the hotel arrangements- all the hotels were charming and the staff friendly and helpful. We found the walking notes excellent. We opted for the level 2 walks, but also did some of the level 1 walks on the rest days. The holiday exceeded our expectations and we will certainly consider another walking/cycling holiday with Headwater. Our representative was excellent; pleasant, welcoming, made useful suggestions/amendments to our travel arrangements and was concerned about our progress during the week. The hotels were varied and interesting. The little towns and villages a revelation. Both the overall route and the walks were extremely well thought out, well spaced and included interesting and varied options to see along the way. Beautiful walks through some of the best wine scenery in the world, staying in some of the top wine villages in Alsace. Rest days are a great idea, but if you wish there are lots of shorter local walks to keep you fit. Very enjoyable holiday in a beautiful part of France. The local representative was excellent. Excellent area for walking with comprehensive notes easily followed. Pleasurable. Decent walking , food, accommodation. An overall pleasant experience, again. Delighted with it. Very smooth, efficient organisation, easy to choose and book, a great location, friendly and cheerful rep. The Alsace walk took us through beautiful countryside, quaint villages and comfortable traditional hotels. A memorable holiday! Another wonderful holiday with Headwater and our first trip to Alsace- a real gem! The maps and detailed notes helped us to explore so many exquisite villages, to stop at will to admire the glorious scenery and to enjoy the stunning wine. A special thank you to Hannah, our rep, who was superb throughout. We cannot wait to return. Pleasant walking through vineyards to picture-postcard villages. We both enjoyed the holiday very much. This was a very enjoyable holiday, Alsace is particularly lovely and unspoiled and the people were very welcoming. This is also an easy walking holiday and is extremely relaxing with opportunity to do some slightly more energetic walks if you wanted. A wonderful and surprising holiday - a glimpse into a way of life in villages which are among the best conserved and most beautiful in France, and through vineyards and woodlands which have hardly changed in centuries. It is an area of stunning beauty and history - as well as wonderful food and wine. A very enjoyable, relaxing holiday in a beautiful part of France. The level 1 walks were easy walking, with a bit more challenge offered by the level 2 optional walks in the forest. Walking notes were very clear and easy to follow. We were impressed with the friendliness and helpfulness of Hannah, the local rep, who was excellent. I initially had some problems getting the info I needed to book the holiday but once Joanne took over everything went smoothly. The holiday itself was great, Alsace is a beautiful region, the walks were proper walks with good guide notes and options for the rest days. All the hotels were great, especially the locations. Our rep Hannah was exceptional and on hand all the time and always offering to provide help & assistance if needed. I think that NE region of France is a hidden gem, we thought the villages were picturesque, the food was great and we loved tasting wines we had very little experience of (luckily we had the car, as we bought quite a lot home!). Overall we loved our trip. Walking the Alsace Wine Trail proved to be a great success. The area really is a hidden gem and we were constantly surprised by the beauty of the villages - mediaeval fortified towns, each with their own character - and the peace and tranquillity of walking through the vines. The walks were just the right length and because of the very high temperatures we stuck to the level 1 walks. Hannah, our rep., was delightful, texted us from time to time to see that we were OK and could not have been more helpful. She really helped to make our trip a thoroughly enjoyable experience. Why do not more people choose this walk? - it was wonderful! Excellent walking holiday - distances between locations were very good for people of our age, and rest days were welcome but with plenty of options for further walking or sightseeing. Information provided allowed us to be independent but in addition our rep was very supportive when needed. we appreciate all the information and support provided and i look forward to travelling with headwater again. We had a lovely holiday and thoroughly enjoyed the walking from one hotel to the next. The route notes were very detailed and easy to follow (especially as we had the maps too). Also the folders in the hotels with customers comments were useful especially for finding restaurants. We particularly appreciated the wine carrying service. It was great being able to buy wine on the way and then find it all in our hotel room at the end. Our rep, Hannah, was very friendly and helpful especially in finding a restaurant for our first night in Turckheim when most restaurants seemed to be shut. We did all the suggested longer walks (even in the rain) and have arrived home feeling very fit! All in all it was an excellent holiday - many thanks to Headwater and to our rep Hannah for her help and encouragement. The first thing to say is how friendly, welcoming, dependable and helpful we found Hannah. We are also aware of the amount of time and effort she put in to assist our fellow travellers after the lady injured herself. We took all the longer walking options and experienced some weaknesses in the route descriptions, which we passed on to Hannah so that she can check them out. We can understand why you chose the hotels that you did, but, while it was interesting to visit Turckheim, Kaysersberg and Riquewihr, all of which are beautiful, we would prefer to have stayed in locations that were not so thronged with tourists. For example, hotels in Kientzheim and Sigoldsheim, very close to Kaysersberg, had English speakers and offered evening meals. Erratic opening times of shops, restaurants and cafes is also a bit problematical as you are setting off not knowing whether or not it is necessary to carry provisions. The cafe in Trois Epis and the restaurant at St Alexis Chapelle are cases in point. In the case of the latter, we would strongly recommend booking in advance. I'm sure Madame in Hotel Constantin would oblige. All in all, we had a good time, enjoyed the local delicacies and wine, the beautiful and varied countryside and, in particular, the lovely unspoilt little villages that we walked through. We now look forward to our next trip with you to Menorca. Great holiday in beautiful location. Headwater team were excellent throughout. Fairy tale ancient towns, which were lovely to explore. The wine, of course was delicious although we did not visit the vineyards on walks but indulged in the evening . The nesting storks were one of the highlights of the holiday. Do try to visit the stork breeding centre it was lovely with a lot to see as well as the storks themselves..
We never imagined walking through vineyards could be so varied and interesting; the countryside was beautiful and the villages charming. The hotel staff all looked after us very well. Our Headwater rep was absolutely delightful and could not have been more friendly and efficient. We did not see a see any UK cars nor heard any other British people but most people we spoke to replied in good English when we spoke to them in our basic French. From the moment we received our holiday information pack we were excited as it really whetted our appetites. We also had a post card from our Rep, Hannah saying that she hoped we would have a good trip and she looked forward to meeting us at the station in Colmar and giving us her mobile number in case we needed her. This was a very thoughtful gesture. So, even though I had a bad back and had to be transported around by Hannah instead of walking, the overall holiday was wonderful. This was such a very well organised package holiday that we felt that we were independant travellers, but with the safety net of a rep, if required. We managed the pace, stops and route ourselves and had a truly excellent break. Apart from the rail debacle, the content of the holiday was stunning. The nature of the medieval villages was quite breathtaking and more reminiscent of Walt Disney cartoons or even pantomime scenery. The vineyard walks were very enjoyable, as were the visits we made to the wineries! In addition the Riquewier 'Council' offer conducted vineyard walking tours, together with wine cellar visits every Friday throughout the summer until harvest time in September WITHOUT CHARGE!! (BUT possibly only in French and/or English). Another Vineyard 'special' (which I don't think you are aware of) is the 'Spirit of the Vines' a line of seven groups of wooden statues representing a modern interpretation of mankind's integration with the vines over the centuries. This is a surreal eye-catcher, not to be missed and is just outside the village of Bergheim. Best to get directions from the local Tourist Office. Most enjoyable holiday, great walks, beautiful scenery and lots of wine tasting along the way. The joy of not using a car for 8 whole days was amazing! The walking was lovely, the grape harvest in full swing, the hotels EXCELLENT with good breakfasts and all arrangements extremely convenient and clear. Flying from Bristol is such fun compared with the toil of Heathrow/ Gatwick. Staying in Paris for the first night makes good sense, and the TGV is superb! There is only one snag...not having a car to bring home all the excellent wines! The Co-op at Turckheim is surely one of the best in France. We really enjoyed our hioliday. The rep gave us everything we needed, but compared to our other 2 headwater holidays, he perhaps wasn't quite as attentive. Three of the hotels were great, but the Constantine was not anywhere near the same quality and disappointing. 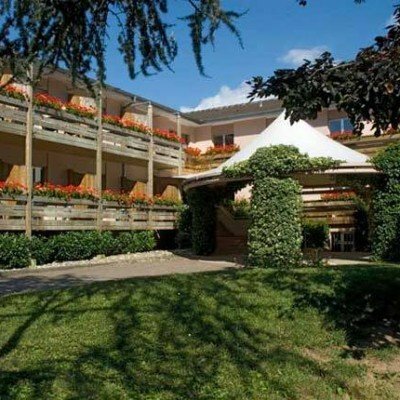 We recommend Hotel Schwendi in Kintzheim, a 20 minute walk from Kaysersberg. We look forward to our next Headwater holiday. Overall summary is that we thought the walks were excellent with a variety of scenery. The hotels were generally very good and the staff as well as local people were friendly and helpful. It is a beautiful area with lovely villages and towns being part of the walking route. We paid £2082 of this holiday. During the trip we ascertained that the accommodation (and yes I have included the upgrades and breakfasts) were valued on booking.com as £911. Plus the two dinners at chez Norbert, say £100, then £1011. This means we have paid £1071 for transfers of baggage (we only paid 80 euros for a taxi from Turkheim to Basel), two maps and appalling route notes. Assuming you had a commission from the hotels based on your bulk buying power then you are rip off merchants. Why the dinner at Chez Norbert included? The choice was a not written but only a verbal one choice (pretty appalling option). We paid almost as much just upgrading to the normal menu as we could have eaten out at a local restaurant without. Is this philosophy to make you look generous because I can assure you it didn't work with us. The restaurant was closed on Tuesdays but no-one told us reception was also closed. They only gave us wifi codes for 24 hours, so we were without internet access for a day. My husband still works and needs internet access at all times. I realise I should have cross checked prices before booking and therefore blame myself for being ripped off, however this will most certainly not happen again. When the rep picked us up in Chatenois, he asked about our arrangements for onward travel - we told him we were intending to get train from Colmar to Basel late in the day. He failed to tell us trains were on strike - left us to find out for ourselves and book a taxi to airport. What is the point of a rep who cannot give the most simple advice. Thank you for taking the time to complete our online questionnaire following your recent holiday to Alsace. Please be assured that all of the feedback we receive whether complimentary or critical is valuable in helping us to continue to improve and develop our holidays for the future and is always well received. We were sorry to read that your holiday did not meet with your expectations; this was disappointing to hear as this holiday is normally a firm favourite with our customers. However, please be assured that we realise how important it is to maintain our high standards of accommodation and service, and we do appreciate we cannot afford to let our standards slip. Therefore all of your feedback has been passed on to the relevant UK and overseas departments and steps will be taken to improve where necessary. In closing we would like to thank you for your constructive comments and hope that despite the issues you have reported you had an enjoyable holiday overall. Overall we did enjoy our holiday and would happily visit the region again! This holiday is to be recommended for those enjoying exercise and the wines of Alsace. The latter is important as much time is spent in and around the vineyards. This was a first time using Headwater.It was an 8 day 'walking' holiday but only 4 days of designated walking and therefore 4 days to 'do your own thing'. Suggestions were made in the guidebook but apart from more walkng or visiting vineyards the villages of Alsace offer little in the way of 'other' activites. I feel that at least 5 (or even 6) days of designated walking would be more appropriate.Overall I enjoyed the experience as Alsace is an area liken no other in France. The holiday overall was well planned and the location was beautiful .The Alsace villages that we visited were most attractive with the old buildings and the history associated with them. As two fit octogenarians we were fully capable of managing the walks. A week that was both invigorating and relaxing in good walking country in the Vosges mountains - with pretty but touristy villages offering a good variety of places to sleep, eat and drink. We found the towns visited quite charming and the accommodation was good. This is a very leisurely and easy walking holiday. We chose this holiday because it was advertised as the easiest grade of walking in an area that looked very attractive in the brochure. We suspected, from looking at the altitude chart, that the second walking day might be more challenging than the grade implied, and we were right! The shorter walk distances were fine for us, the directions were clear and the maps helpful, although we could have managed without them, as the walking notes were so good. We did have occasional problems finding the waymarks, particularly on Day 2, when we assume they had been on trees which had fallen. The villages we stayed in were very picturesque, the hotels were welcoming and the arrangements all worked very efficiently. We have been on many Headwater holidays over the past 30 years and always enjoyed them, although we are choosing the easier grades nowadays. I would recommend this holiday, with the proviso that it is definitely NOT flat walking. Most days had a fair number of uphill and downhill stretches, and the second day in particular was a very lengthy uphill effort, with a couple of steep pulls, followed by some fairly tricky downhill walking through forests with fallen trees in places. We found our walking poles very useful, particularly on Day 2. Thank you for taking the time to complete our on line questionnaire and for your feedback regrading the grading of the walks , please be assured that all of the feedback we receive is valued by us and is used to help improve and develop our holidays for the future. It was great to read that you enjoyed your holiday to France. Although, I am sorry that you found some of the walks more challenging than you expected. This year we introduced a new grading system of soft/leisurely/moderate/challenging. In previous years we have used a �boot� rating. However, we have received mixed feedback regarding this new grading system and a number of people have told us they feel the old boot ratings gave a clearer indication of what was involved. We have therefore decided that from Nov 2013, we will be reinstating our previous system, in order to avoid any future problems. We will therefore be rating this holiday as a 1 boot which I hope you will agree is a suitable rating. I am also sorry that you found discrepancies with some of our waymaking points, this is checked at the beginning of the season and then throughout as necessary, I have passed your comments on to our local rep, he will be re checking the routes before the start of the new season and will check out your feedback to ensure it is corrected. Thank you once again for your constructive comments and for your loyalty over the years, we do hope to welcome you on another Headwater holiday in the future. We really enjoyed our holiday. It was a lovely area with some hearty food but fabulous wine. It was great to be able to taste the wine and then for Chris to transport it for us. I would have been happy to walk every day as the walks were not strenuous and we were at the next place by lunch time giving time to explore in the afternoon. We felt that it would have been useful to have known beforehand that each hotel had free wifi and also to have known that shampoo was not provided. Beautiful small towns and villages, beautiful scenery and captivating history. Hotel accommodation was generally good and Chez Norbert's air conditioning was most welcome with temperatures in the mid to high 30's. At Bergheim on chef's night off we were relocated for dinner to the Weinstub up the street. The lady in charge was most reluctant to provide a menu at the sum Headwater had allowed. Two of our party accepted the 'no choice' modest three course meal and we chose a'la carte. Food was indifferent and the wine overpriced. Apart from Chez Norbert, ventilation was inadequate in the hotels, fans were not always available and other clients complained that Headwater guest's rooms were usually located in the roof and were in consequence, unbearably hot. Our upgraded room in Turkheim was fine! We missed the initial briefing which was a pity. Although our expected arrival time was late afternoon, we were actually in the hotel when Chris arrived with his clients from Colmar. A shame he didn't check. This oversight did not detract from our holiday experience as our friends briefed us. When we eventually met Chris he impressed us as helpful, efficient, and friendly. The Alsace Wine Trail was one of the very best holidays I have ever taken. The region was unknown to me and was delightful in all ways. The wine was excellent, my only regret is that it wasn't longer. Excellent experience. Able to walk at our own pace. Very intersting area to travel in. This is a self-guided walking holiday staying in small hotels in small towns or villages and requires a certain amount of tolerance, flexibility and common sense particularly when routes don't work out as they seem. We were disappointed to have two of our hotel/restaurant meals deleted (we were provided with cash to fend for ourselves!). This meant that we had only two meals during the holiday arranged for us by Headwater instead of four as noted in the guidance. This and some missing or bad forest signage were the only miner blips in an otherwise excellent and enjoyable holiday. Very relaxing holiday as able to walk at own pace and stop for wine tastings along the way. Independant walking was very easy as the directions and maps provided were excellent and the paths well signed to match the maps. A beautiful area to explore. Due to the tailor-made nature of our holidays, we need a little more information in order for us to check availability for Villages & Vineyards of Alsace. Simply complete the form below and a member of our sales team will contact you (when it's most convenient for you) to provide availability information, travel options and an accurate price. Of course there's no obligation, but if you do wish to proceed with a booking they will be on-hand to assist you throughout the process.